On Saturday July 11th, 2009 at 4:30 in the afternoon, Barrett Griffith (27), a local resident and surfer saw his afternoon session turn into a test of his life saving skills. “As I was walking down the beach, towards the estuary from Cangrejal I noticed a startled women ahead of me,” says Griffith. “Everything happens for a reason,” Barrett adds. Having grown up in the water in Jupiter, Fl Griffith goes on to tell us that he had training as a beach lifeguard and was a competitive swimmer for 6 years. The last two years Griffith has been living in Playa Samara, surfing for PuraVidaDeals.com. PuraVidaDeals.com is the hub for finding deals around Costa Rica and has been compared to craigslist and ebay. 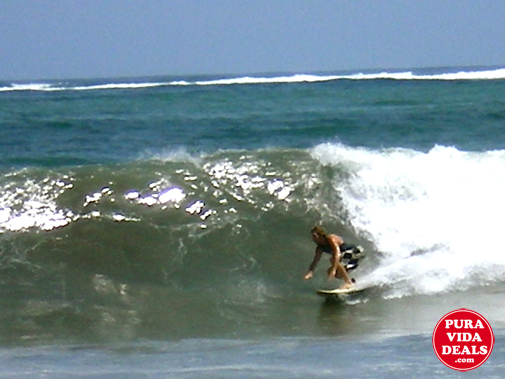 PuraVidaDeals.com is proud to have a Lifesaver as one of our sponsored surfers.